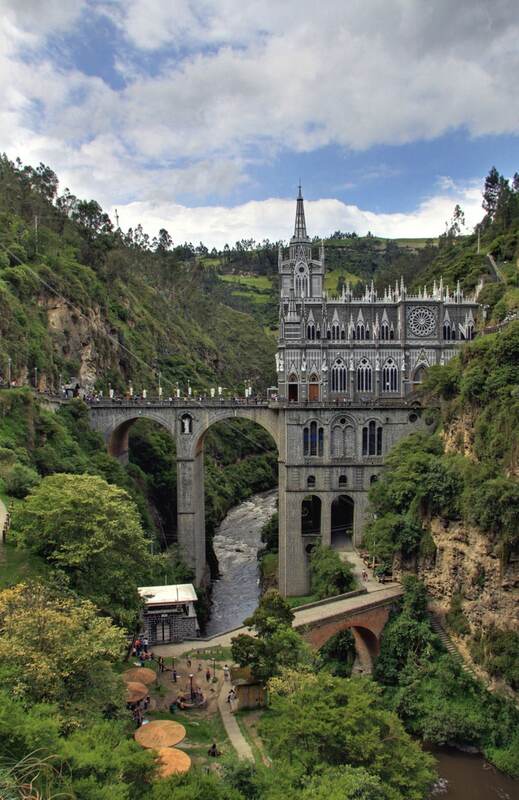 Las Lajas Sanctuary is a very special building thanks to its topography. 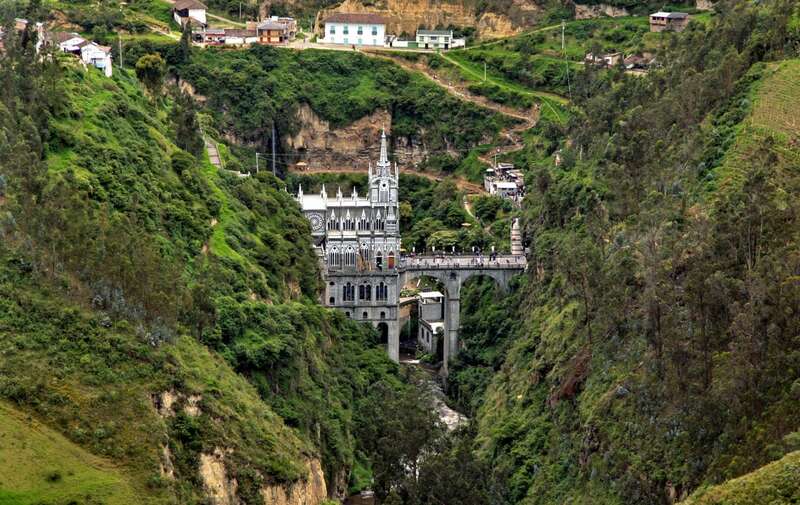 This beautiful church is built inside the deep canyon of Guáitara River, in the place where in 1754 was seen an apparition of Virgin Mary. "The mestiza is calling me!" Chaplain of sanctuary Justino Mejia y Mejia in his book from 1931 "Tradiciones y documentos: apuntes relativos a la historia de Nuestra Señora de las Lajas" wrote that in 1754 the indigenous women María Mueses and her deaf-mute daughter Rosa were caught in an unusually strong storm. They entered the canyon and sought a refuge between the large slabs of lajas – local variety of shale. The lightnings illuminated the canyon and at one moment a miracle happened: deaf-mute Rosa exclaimed: "the mestiza is calling me!" and pointed at one of the large pieces of shale. Lightning illuminated a silhouette of virgin on the stone. The fame of this site spread among the people of this region, acquiring more and more fame. Many miraculous healings have been reported here. In the 18th century here was built the first structure – a simple hut from wood and straw. It was standing here for some 40 years. The shrine was first mentioned in the book "Wonders of Nature" written by a Franciscan friar Juan de Santa Gertrudis who was sent here from Spain and worked here in 1756 – 1762. In January 1795 started a construction of a new chapel – this time from brick. It was completed in 1802. Soon this building was extended and an impressive structure now adorned the Guáitara canyon, with incredibly tall walls rising high above the river. Later here was built a bridge with two arches towards the church, thus bridging the canyon at the shrine. The current church was built in January 1, 1916 – 20 August, 1949, replacing the previous structures. This daring achievement of structural engineering was built by Ecuadorian engineer Gualberto Pérez and Lucindo Espinosa from Pastaza. 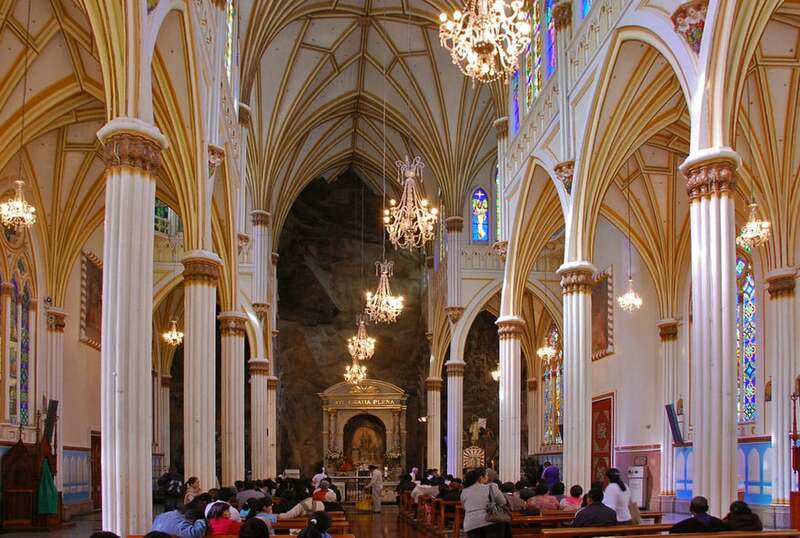 Works were paid by the contributions of many faithful from Colombia and Ecuador. 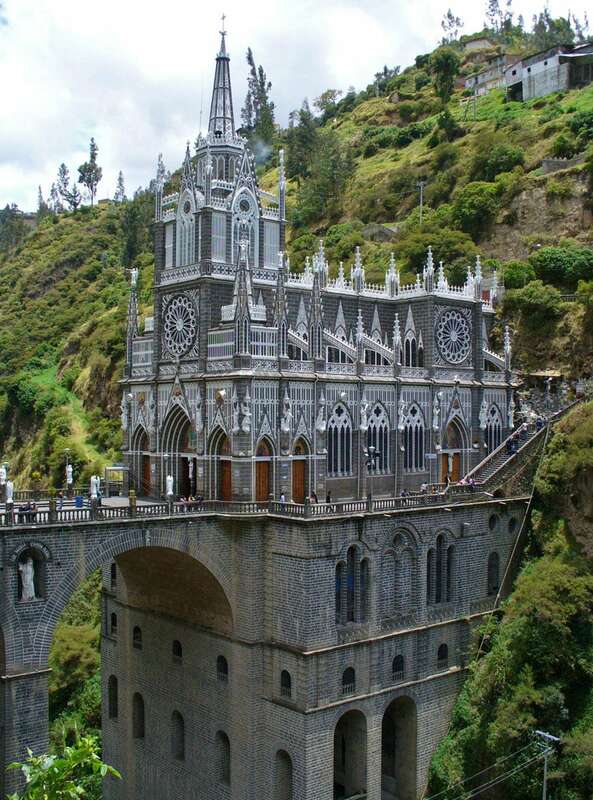 Las Lajas Sanctuary / Ollie Harridge, Flickr. CC BY 2.0. The church rises 100 m high from the bottom of the canyon. 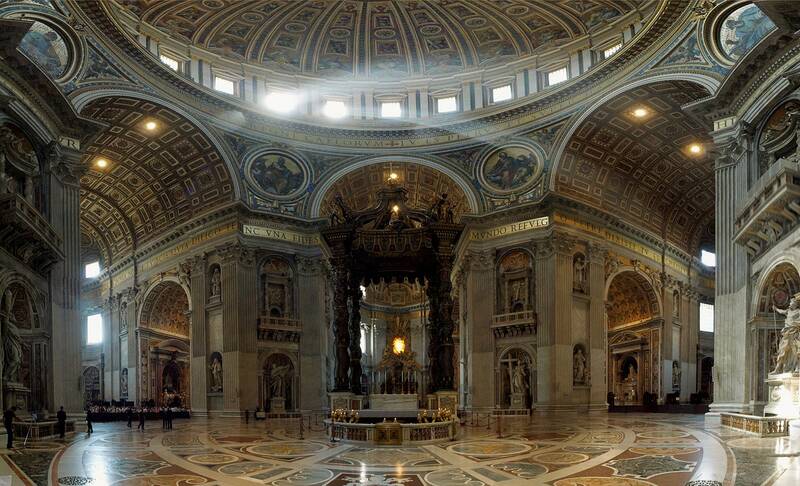 Church itself is 27.5 m long and 15 m wide. It is built in Neo-Gothic style, with the characteristic vaults. It is adorned with stained glass made by Italian Walter Wolf. In the nave of the church stands a painting of Virgin of the Rosary painted by an unknown painter. The enormous basement part is built in Neo-Romanesque style. The bridge towards the church is located 50 m above the river, it is 20 m long and 17 m wide, has two arcs. This bridge forms an impressive plaza in the front of the church. 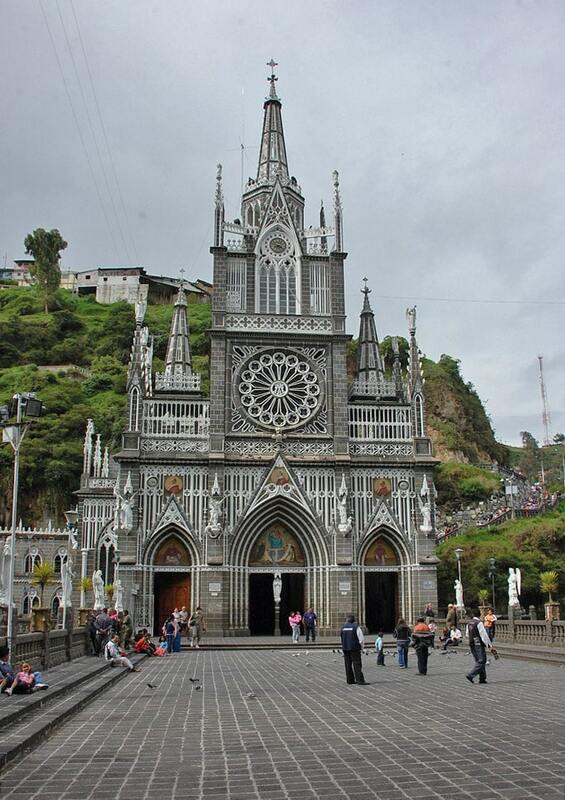 In 1951 Roman Catholic church authorized the Nuestra Señora de Las Lajas Virgin, and the church was declared a minor basilica in 1951 – now one of 26 such minor basilicas in Colombia. Inside the Las Lajas Sanctuary / Ollie Harridge, Flickr. CC BY 2.0. Piligrims are coming to this shrine throughout the year. Numerous plaques on the rocks around the church tell about the cases of miraculous healings. 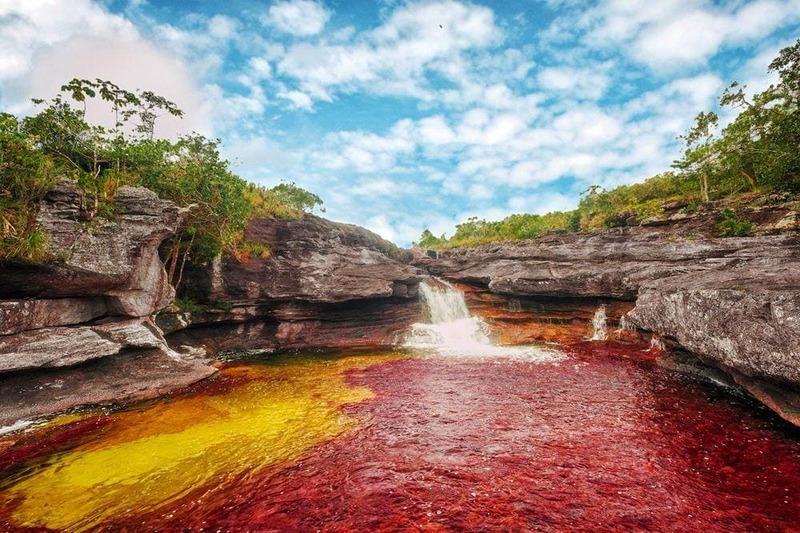 This enormous and extremely diverse country has many spectacular landmarks. Many Colombian attractions are little known and even not named – there are many wilderness areas still waiting for explorers. Christianity has had an undeniable impact on Latin America, which has in turn transformed Christianity itself. Focusing on this mutually constitutive relationship, Christianity in Latin America presents the important encounters between people, ideas, and events of this large, heterogeneous subject. Idyllic colonial towns and fast-paced cities, jaw-dropping mountains and stunning beaches: see it all with Moon Colombia.